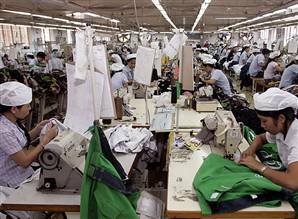 Over 800 workers at a Taiwanese-owned garment company in Ho Chi Minh City struck work Wednesday demanding lower workload and social welfare coverage. The workers at Top Royal Flash Ltd. said they had been forced to work overtime four or five days a week for the past four months. Though the company had deducted part of their salaries to pay social insurance for half a year, it did not send the amount to the authorities, according to the workers. The company also lengthened new workers’ probation period. The city’s labour department, acting as an intermediate at a meeting between the two sides, asked the company to pay VND1.2 billion (£38,000) in social insurance it still owed. The company was also asked to negotiate with workers in case of overtime shifts and make its salary regime public. The workers agreed to return to work Thursday after the company director, Hsu Chi Cheng, promised to fulfil the demands. Vietnam has seen a wave of wildcat strikes in recent months, many in the garment sector.